Early morning streaming, Whovians (2017) and Knock Knock (2017) | Randomwhoness: a Doctor Who blog by Johnny Spandrell. Sampling stories in random order. It’s 5:30 on a Sunday morning. I am awake, due to my life long habit of waking naturally by the time I know I have to be up. All is dark and quiet. I sit up in bed, reach for my iPad and headphones. It’s time for a new episode on Doctor Who, delivered fresh and perky from ABC iView. It’s a ritual made familiar over the last few years, since the ABC has been fast-tracking new episodes of Doctor Who as they’re broadcast on BBC1. It’s the new way of watching Who, having taken over from Sunday night after the news, or if you could navigate through the ocean full of viruses and malware, bit torrenting. When I was a youth, it used to be Monday to Friday, 6:30pm, which as I’ve mentioned before, is Australia’s version of Saturday teatime. Somehow though, I can’t see Big Finish producing audio promos in years to come harkening back nostalgically to watching the show this way. Can you imagine? It’s pre-dawn 2017 all over again! You’re hiding under the covers, hoping none of your family wake up! If I’m lucky, I’ll get through the whole episode uninterrupted. If not, Master Spandrell will stumble in and sleepily climb into his parents’ bed and that will be the end of that. If not that, then Little Miss Spandrell might cry out from her bedroom, looking for an early start to the day. So I keep as quiet as I can, keep physical movement to a minimum and hope desperately to remain unnoticed. This week’s episode is Knock Knock. And it’s been specifically designed to be consumed by nerds on tablets hoping to remain uninterrupted. Periodically Doctor Who adapts with a change in format. Spearhead from Space may be the first colour story, but it’s not until The Green Death that there’s a story conceived around being seen in colour. Ghost Light might be the first story designed for the VHS generation, a story you have to pause and rewind to understand. And the show’s 2005 series might be as much designed for consumption as a DVD boxset as a broadcast TV show. In more recent years, we’ve had ancillary Doctor Who content designed to be watched on computer. It’s arguable which was the first such piece of content (as we call it these days) but The Night of the Doctor is definitely designed to be sought out online. Doctor Who you can’t watch on TV. I watched the special binaural edition of Knock Knock, on my headphones, tucked up in bed, and very nice it was too. One specific knock made me involuntarily turn my head towards the supposed source. It’s an experience you can get on TV, by streaming from your tablet but to get the full effect (apparently) you need headphones. This is Doctor Who designed to be watched on your phone or iPad. I suggest we get used to this. Doctor Who’s ratings are doomed to fall in future (although our new female Doctor – hooray! – should deliver an initial boost in numbers) and that has nothing to do with the quality of the show. The fact is all broadcast TV is losing viewers, and an increasing amount of people are watching TV shows on tablets and phones. It’s unsurprising there are special editions of Doctor Who for mobile devices; it’s only surprising that there’s not more of it. How long, I wonder, until we get a spin off series delivered through catch up services like iPlayer and ABC iView only? When you think about how much time, money and effort went into one series of Class (which awkwardly straddled online and broadcast formats) an iPlayer only series may well offer a lower cost, less risky venture. It could lead to some narrative innovation too; freed of the requirement to fit into a 45 minute time slot, stories could be longer or shorter as the story demanded. Doctor Who for the commute home. Then there’s factual content like Doctor Who Extra and The Doctor Who Fan Show both made for consumption across all devices, but I suspect mostly consumed on mobile. The show is building and nurturing its web-only fans. There must be fans out there now who have never watched an episode of the show on broadcast. Surely it’s only a matter of time before our first catch-up exclusive episode? There’s a final destination here. 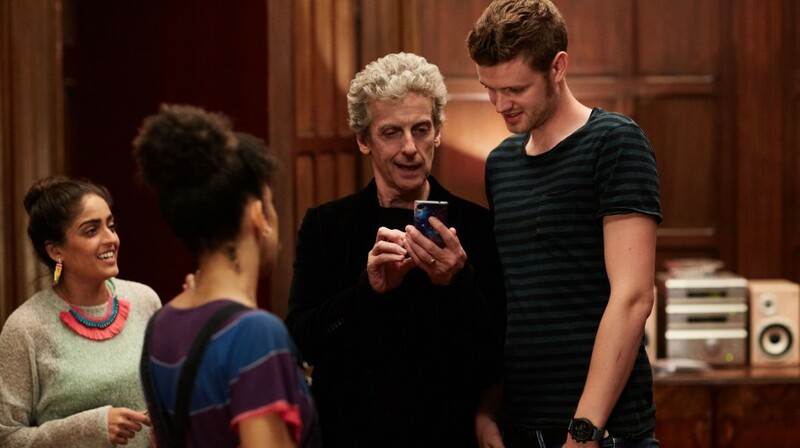 We think of Doctor Who as a TV show, which is also available on other devices. Eventually it will stop being a TV show, and simply be a show, with broadcast TV being merely one way to watch it. If at all. It’s not inconceivable of a future where new Doctor Who is an internet only experience, the same as other streaming only shows. All of which makes Whovians all the more strange. In Australia, series 10 was accompanied by a 30 minute home made show about watching and loving Doctor Who. It’s hosted by Rove McManus, one of Australia’s biggest TV stars, who had a highly successful evening variety show for years during the noughties, followed by a US chat show for a couple of years. He has always had something of the nerd about him, but he remains an unlikely host, let alone instigator, for a Doctor Who panel show. For one thing, he’s far too cool to display the Ming Mong level of fandom he clearly possesses. And for another, he’s far too expensive for the ABC. He can only be doing this for the love of it, which is terrific. But Whovians seems to be exactly the sort of after party programming the BBC has been avoiding. Not only is it content they’d be more likely to put online, it’s actually mimicking what happens online after an episode going out live on air; a community of geeks wants to talk about it. It’s fun and its frothy and I love it, but the fact that it’s new broadcast content about Doctor Who seems to be directly the opposite direction that the show itself is heading in. None of this is bad. It’s just that for a week in 2017 I watched an episode of Doctor Who designed not to be watched on TV, then tuned into a TV program to hear people talk about it. Welcome to the patchwork landscape of 21st century broadcast TV. QUICK APOLOGETIC ASSESSMENT OF THE STORY WHICH IS THE SUBJECT OF, YET IGNORED BY, THIS POST: Spooky, exciting and a bit gross. But under no circumstances should you examine the plot too closely. LINK TO The Ice Warriors: spooky mansions. NEXT TIME: where do you get the milk? I get mine at the Asylum of the Daleks.